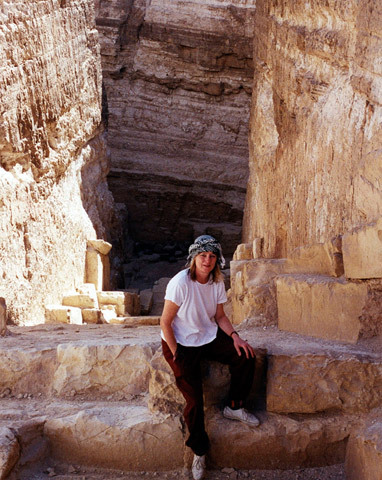 Olivia Temple sitting at the top of the vast open shaft at Abu Ruash, six miles north of Giza on a hill. 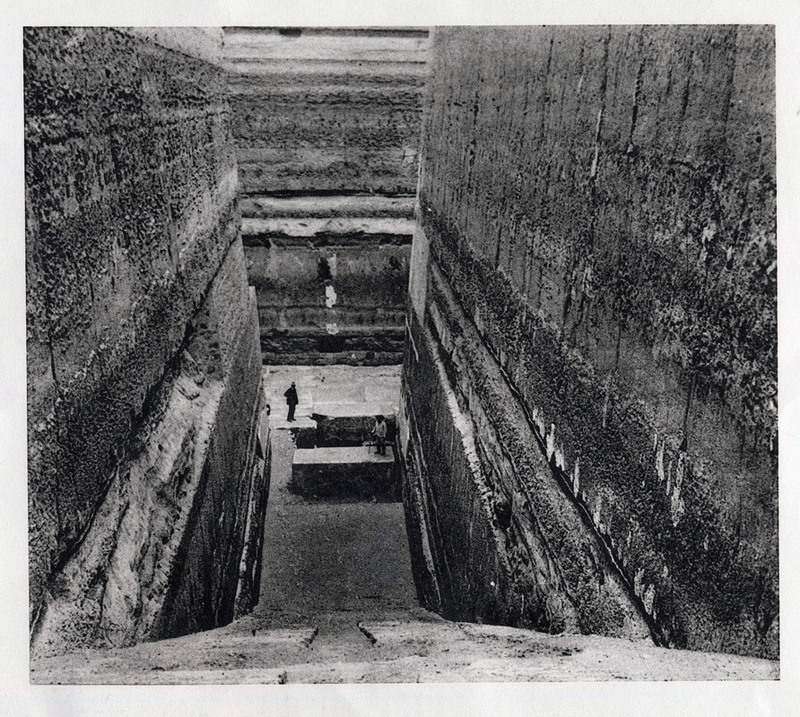 The shaft points due north and was in my opinion an astronomical observation shaft for stars crossing the meridian (the north-south line). 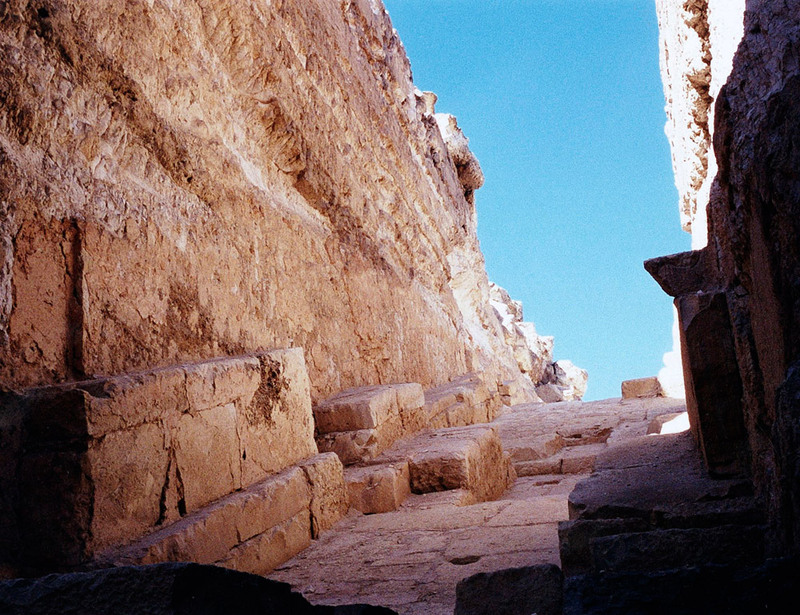 Without such a shaft, the Egyptians could not have achieved sufficient accuracy with their calendar to be certain of the correct dates of all their religious festivals. 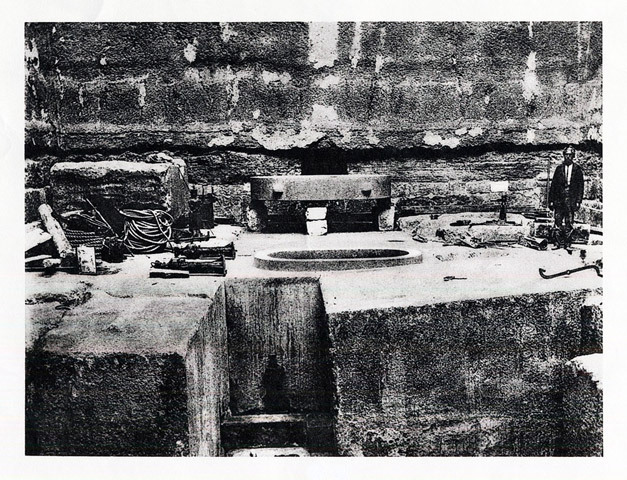 (They did this by noting the precise moments when key stars crossed the meridian line in the sky by sighting up the shaft, known as ‘observing stars culminating at the meridian’ by astronomers.) A similar dilemma faced the Roman Catholic Church for centuries, and led to their adopting extraordinarily complex and expensive measures to use their vast churches in Italy and France (such as Saint Sulpice in Paris, as mentioned in The Da Vinci Code) for observing solar rays along brass meridian lines inlaid into the church floors, in order to be certain of the date of Easter. 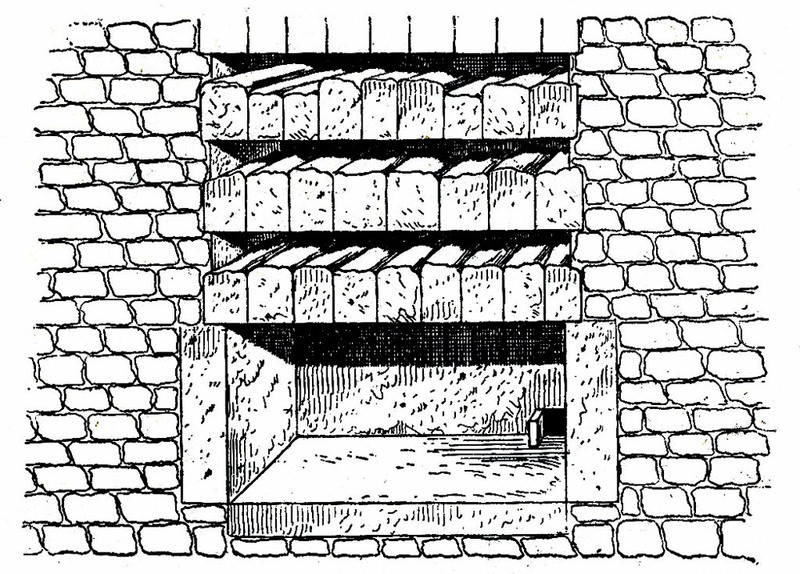 The idea, often suggested by people who have not thought the matter through, that a pyramid once stood on top of this shaft is ridiculous, as there was only a wall around the site (see Figure 10), never a pyramid. 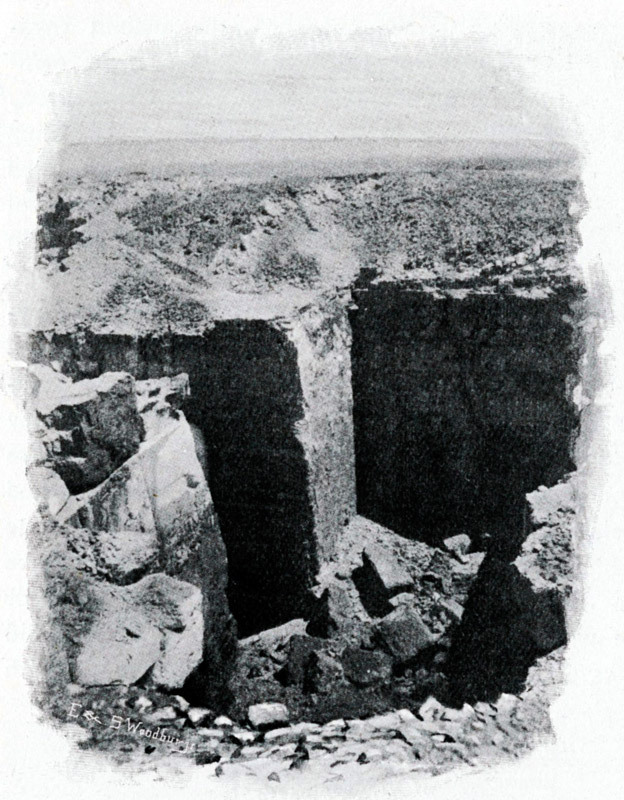 A ‘twin’ of this shaft exists also south of Giza at a place called Zawiyet el-Aryan, but it is inside a military base and no archaeologists are allowed to visit it. 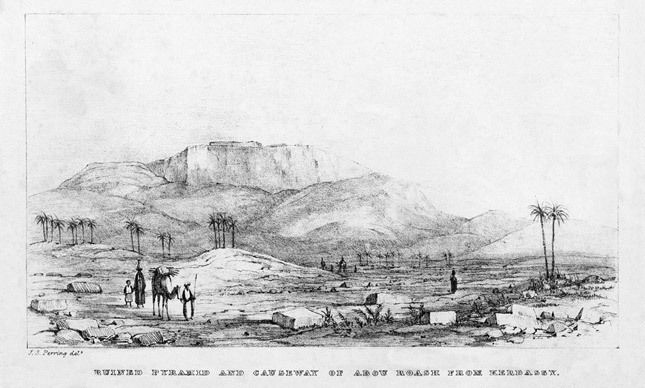 For old photos of it before the military base was constructed, see Plates 8 and 8B. 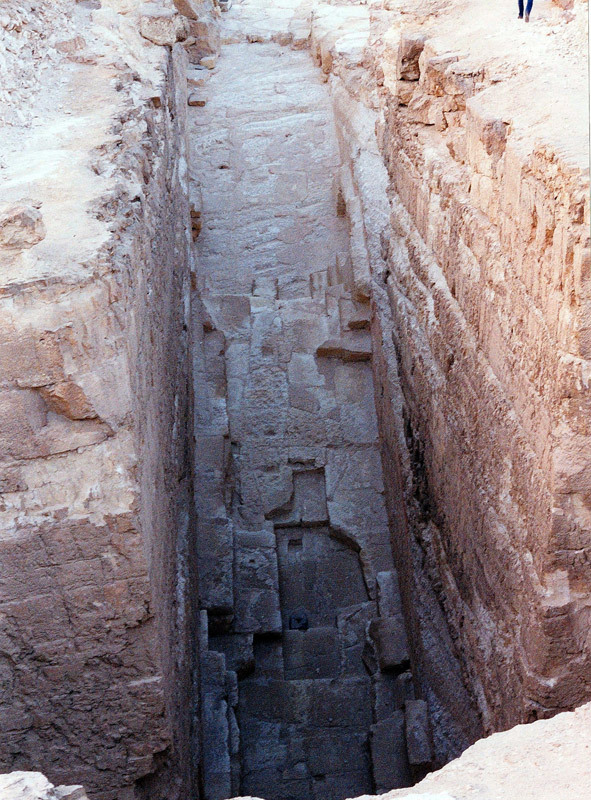 The Zawiyet Shaft excavations revealed its association with a Third Dynasty pharaoh named Nebka, whereas the Abu Ruash Shaft has associations with a Fourth Dynasty pharaoh named Djedefre, who even built a mudbrick temple nearby, from the ruins of which a magnificent portrait bust of him was excavated. 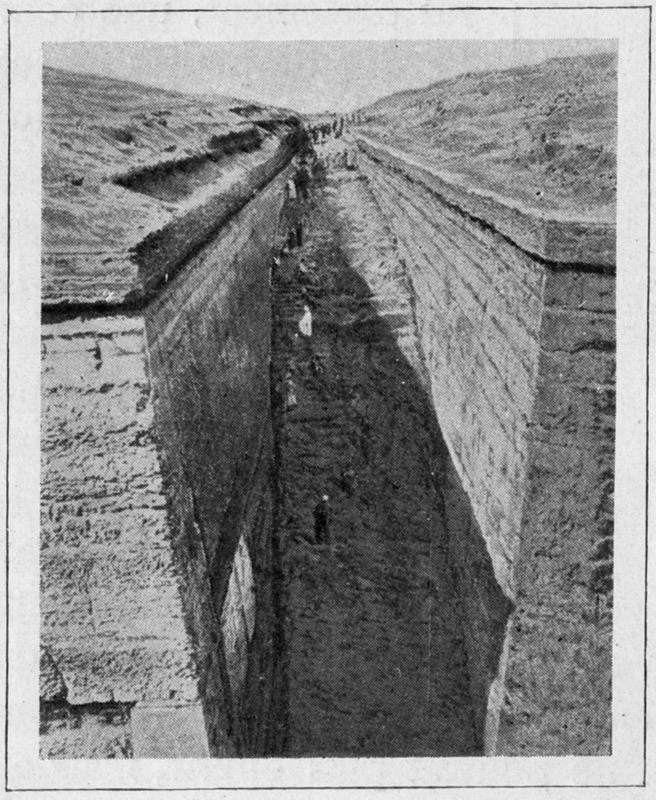 It also appeared the next year as Figure 2 on page 295 from Lauer’s article ‘Reclassement des Rois des IIIe et IVe Dynasties Égyptiennes par l’Archéologie Monumentale’ ‘Rearranging of the Kings of the Third and Fourth Egyptian Dynasties on the Basis of the Archaeology of the Monuments’, Académie des Inscriptions & Belles-Lettres, Comptes Rendus … 1962, Paris, 1963, pp. 290-309, with a Response by Pierre Montet on pages 309-310. 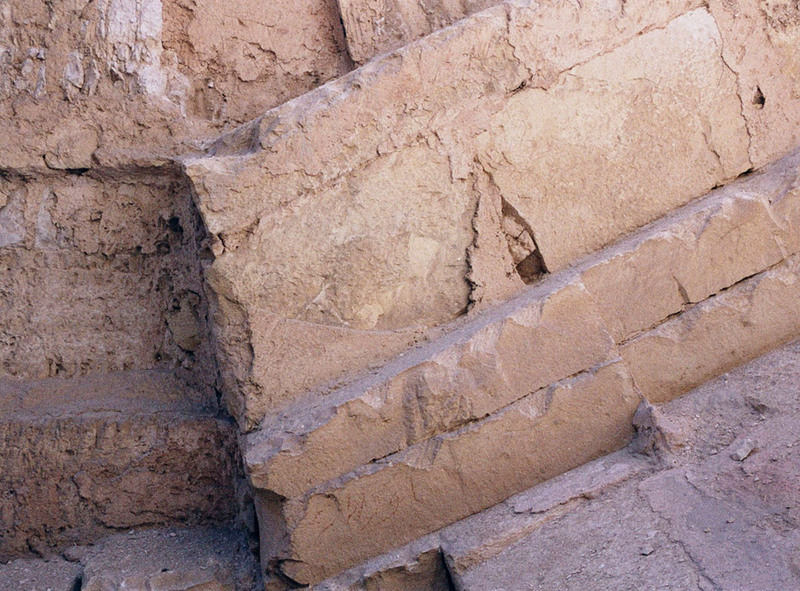 A smooth portion of the eastern face of the Pyramid of Mycerinus, surrounded by rough portions. 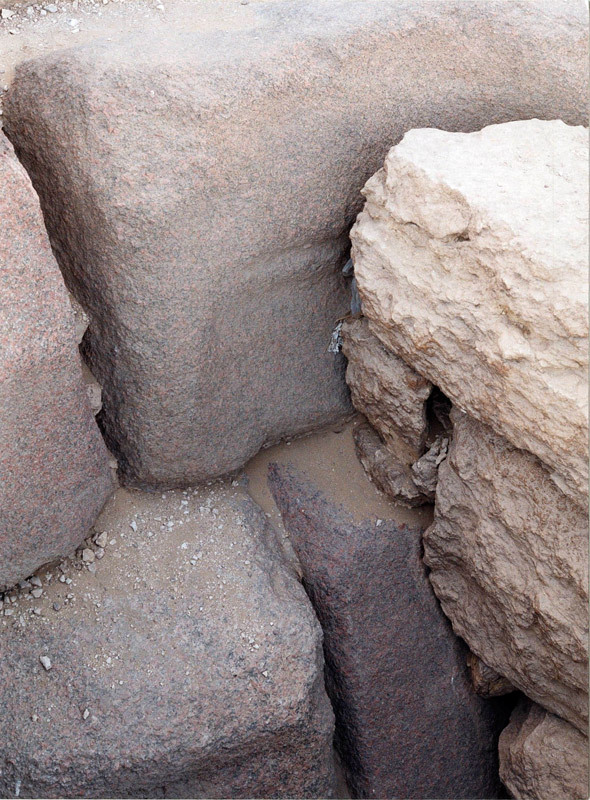 No one knows why the granite casing stones alternate in their outer surfaces in this manner, except that on the north face it signifies the location of the entrance. 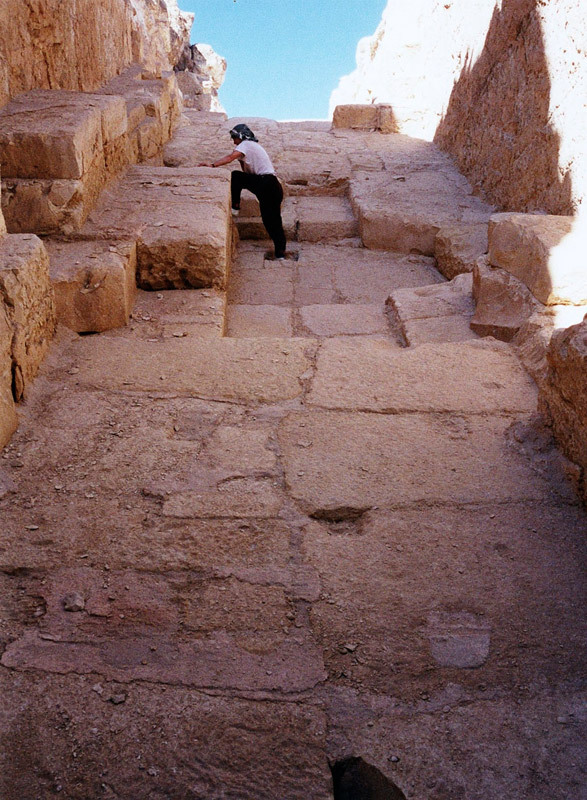 In the foreground here, the pavement of the Mycerinus Funerary Temple may be seen. 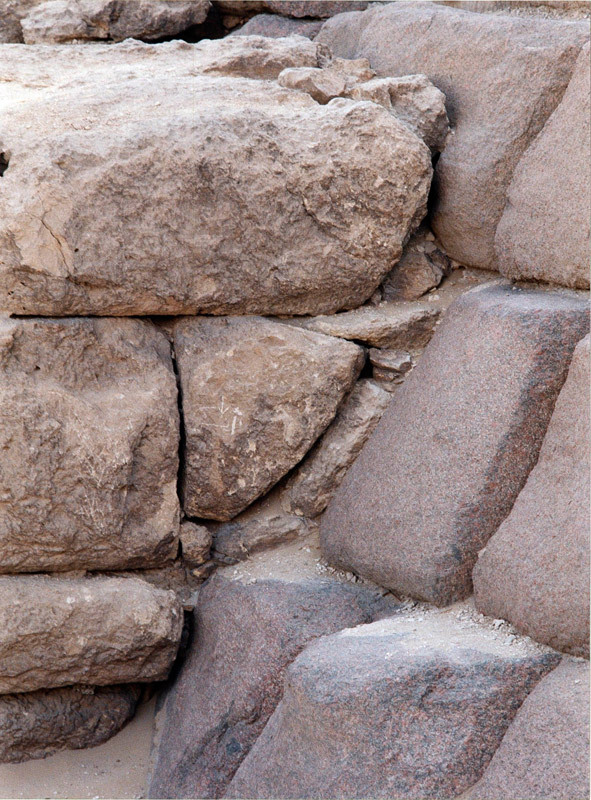 Whereas the casing stones of the pyramid have no visible mortar between them, the paving stones of the temple are much cruder and have substantial amounts of mortar between them, suggesting that they were built by less skilled workmen than those who built the pyramid. The pavement is also clearly ‘shoved up against’ the pyramid at a later date, and this is done rather crudely. 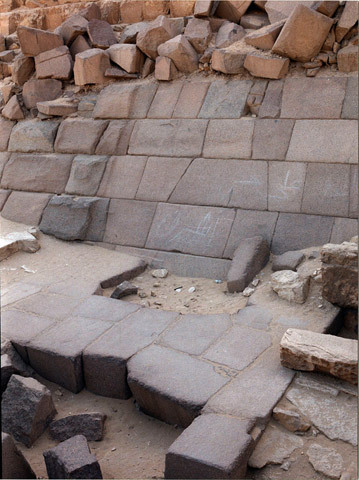 Because the pavements of the funerary temples of the other two main Giza pyramids do not survive at their western edge like this, we cannot see whether those also were ‘shoved up against’ the eastern faces of those two pyramids in a similar manner. 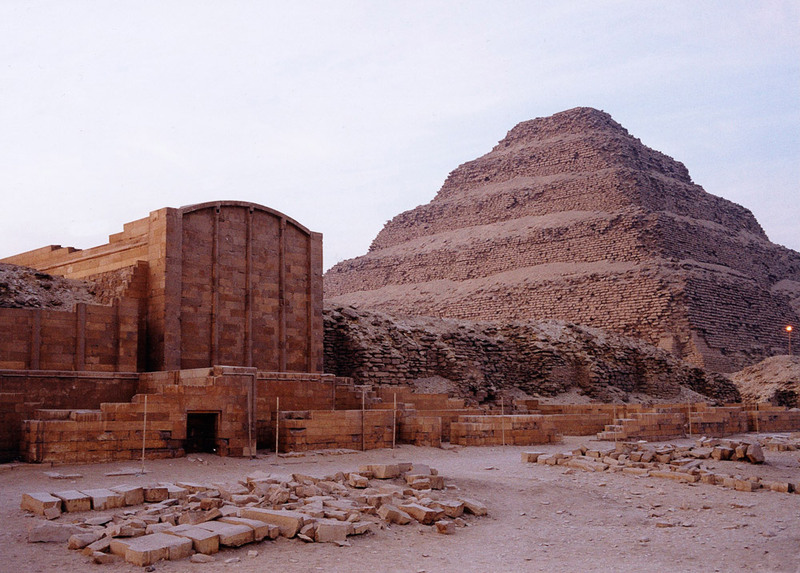 However, if one of the three Giza funerary temples was demonstrably a later addition as this is, then this suggests that all three of them were, and this substantiates my suggestion that the pyramids were ‘usurped’ for funerary purposes by the later pharaohs Cheops, Chephren, and Mycerinus. 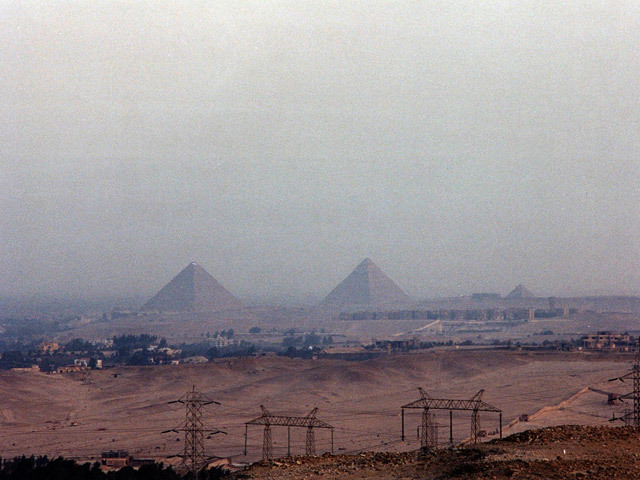 The three pyramids of Giza seen through the Cairo smog from the top of the hill of Abu Ruash. 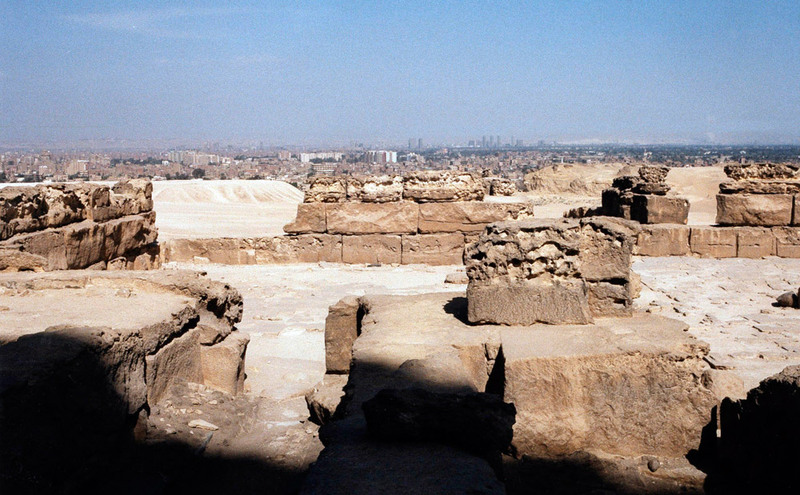 It was on this hilltop far from Giza that Pharaoh Djedefre, who reigned circa 2581-2572 BC, between the reigns of Cheops and Chephren, was supposed to have built a large pyramid. 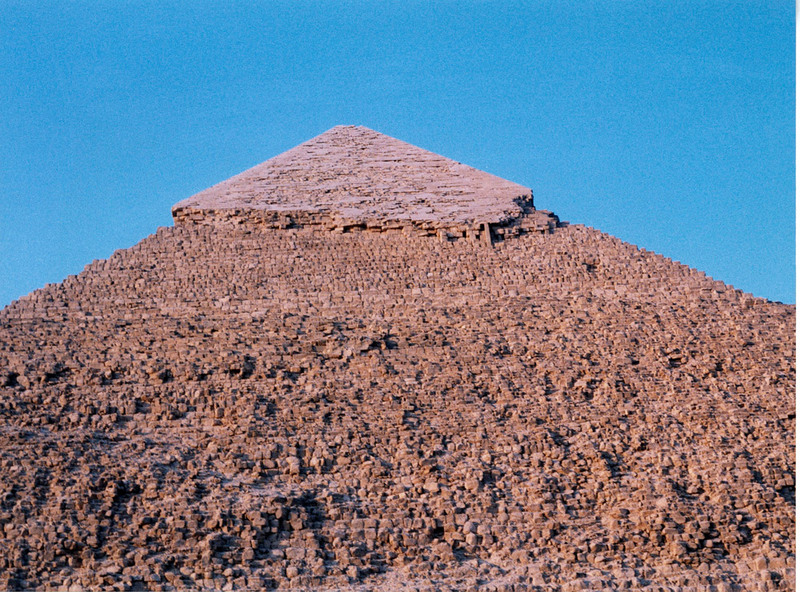 However, no pyramid is actually there, and it is doubtful that any ever was. What is there is a gigantic excavation of the bedrock to form a mammoth descending passage and chamber, but these are exposed to the sky and seem never to have been covered over. 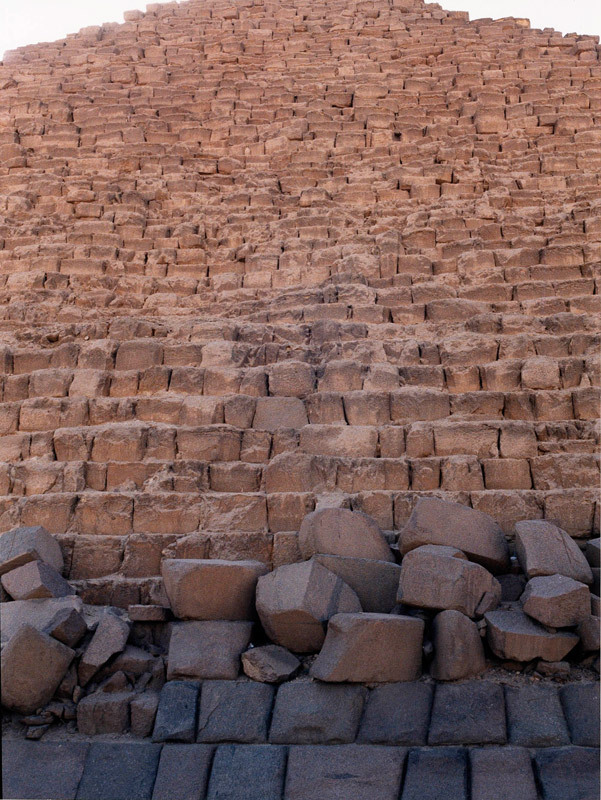 Massive stones forming some sort of surrounding structure on the surface survive, and many are known to have been carried away. 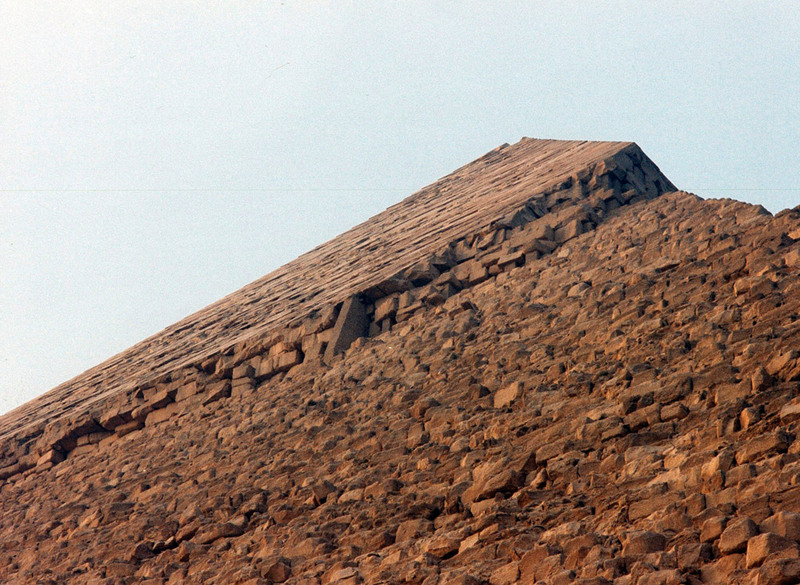 But it cannot be demonstrated that these ever constituted even the beginnings of an actual pyramid. 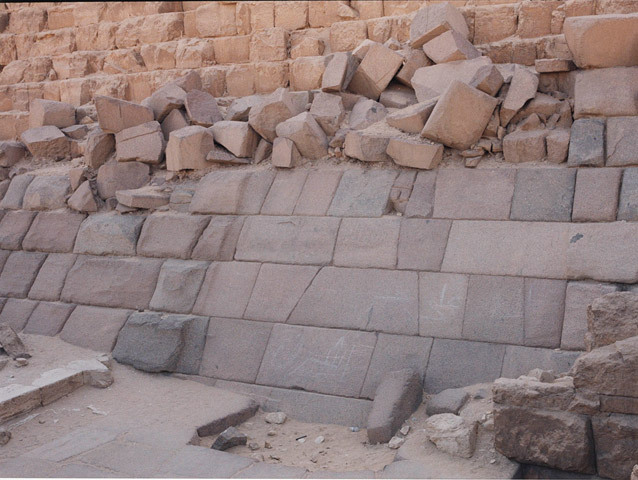 Certainly if a pyramid were commenced here, it was never finished. 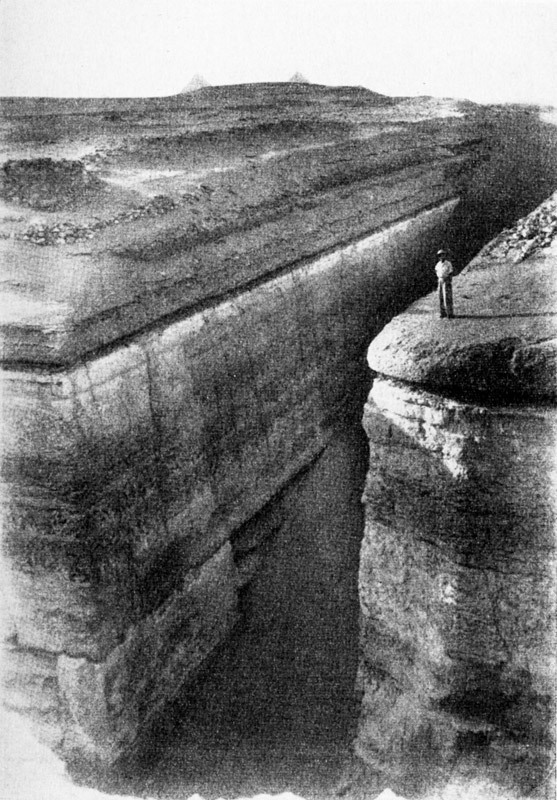 The Abu Ruash ‘thing’, whatever it was, was certainly huge, but it is not certain what it actually was. 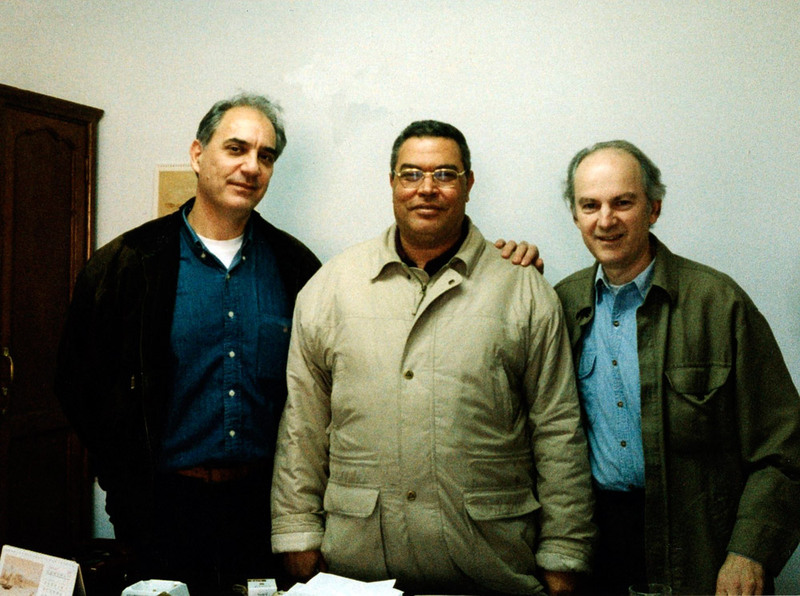 Its supposed association with Djedefre is also established only through circumstantial evidence, and there is no direct evidence. 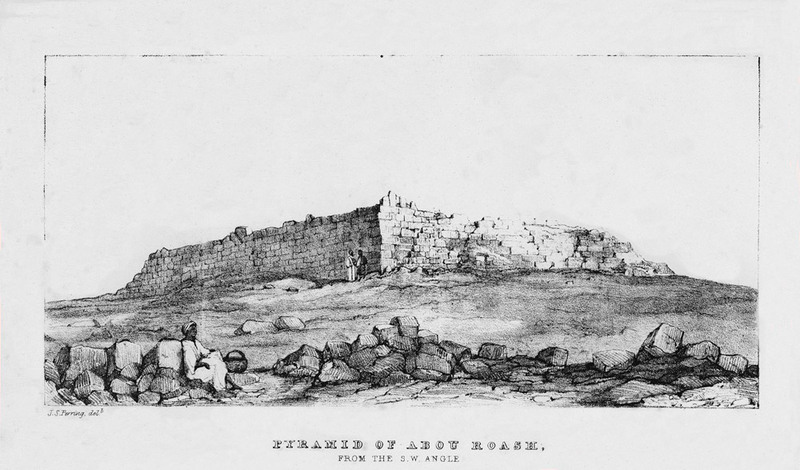 I believe that the Abu Ruash site was a merdianal astronomical observation shaft, and that it was surrounded by a stone wall (see figure X). 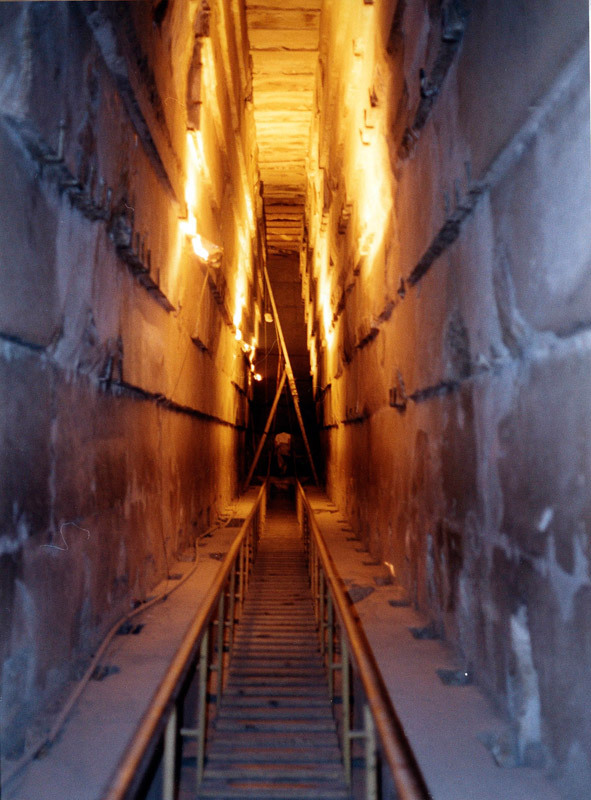 This photo gives the necessary perspective to show the relationship between the site and Giza, which lay 600 feet below and six miles away to the south. Here we see remaining casing stones of the two main Giza pyramids drawn clearly by Piazzi Smyth, to show what they were like. 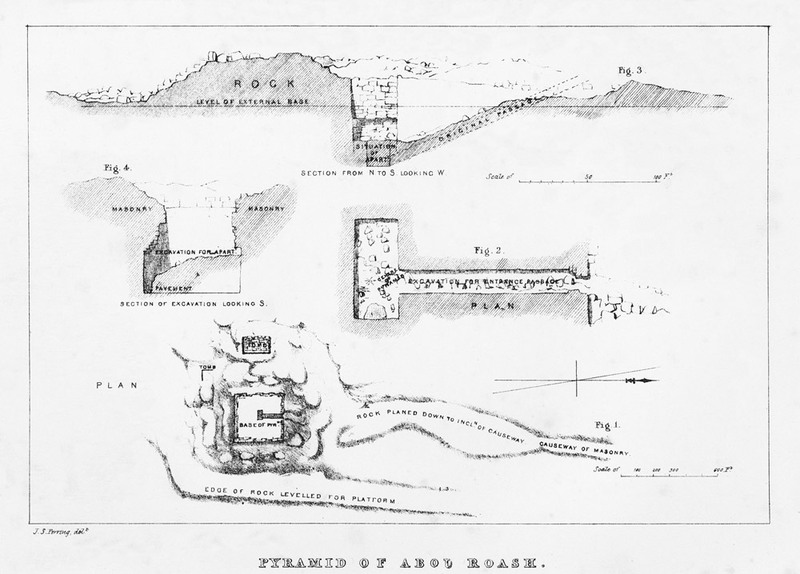 From Charles Piazzi Smyth, Life and Work at the Great Pyramid, Edinburgh, 1867, 3 vols., Volume II. 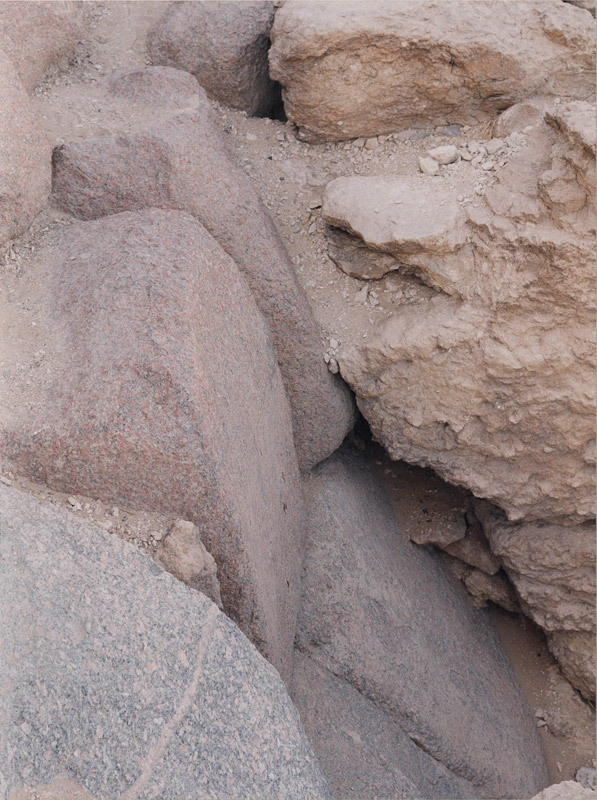 The two inscriptions of the name of the Third Dynasty King Neferka, inscribed in royal cartouches, which were found during the excavation of Zawiyet el-Aryan. 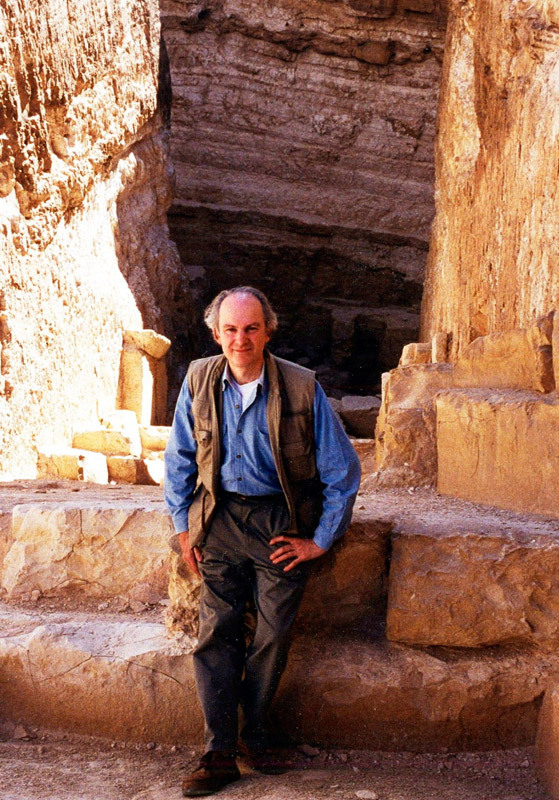 These demonstrate that the site cannot possibly be of Fourth Dynasty date, as many Egyptologists erroneously insist, and for which there is absolutely no evidence. 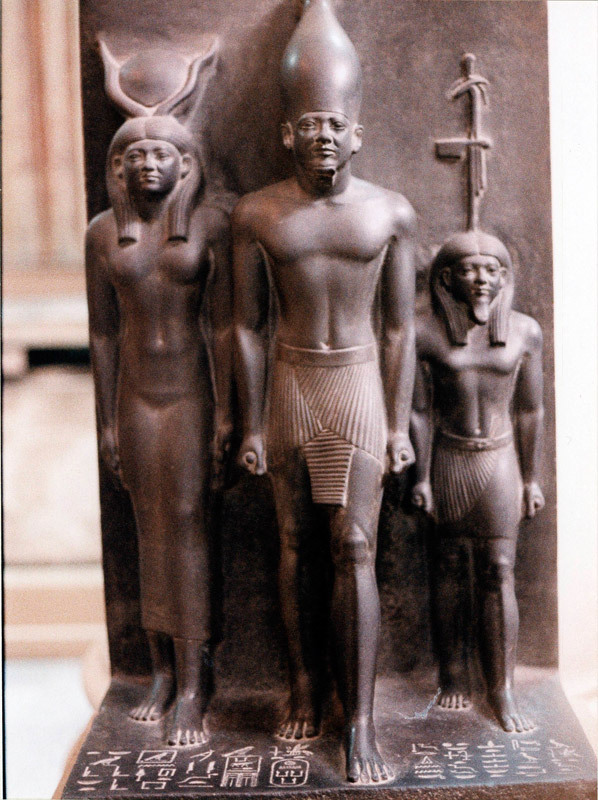 These are Figures 3 and 4 on page 305 of Jean-Philippe Lauer’s article ‘Reclassement des Rois des IIIe et IVe Dynasties Égyptiennes par l’Archéologie Monumentale’ ‘Rearranging of the Kings of the Third and Fourth Egyptian Dynasties on the Basis of the Archaeology of the Monuments’, Académie des Inscriptions & Belles-Lettres, Comptes Rendus … 1962, Paris, 1963, pp. 290-309, with a Response by Pierre Montet on pages 309-310. 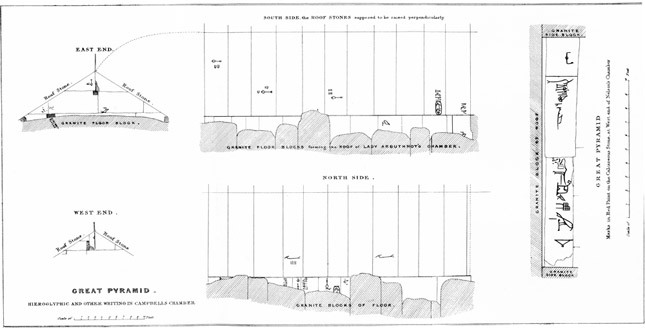 Jean-Philippe Lauer’s section and plan of the exposed shaft and chamber at Abu Ruash, based upon the earlier section and plan drawings of John Perring in the 19th century. 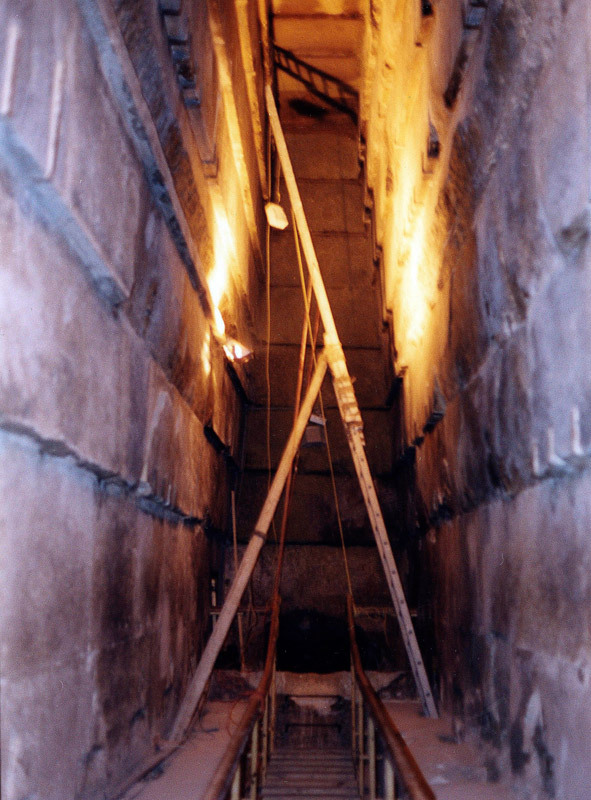 Note the precise north-south alignment of the shaft. 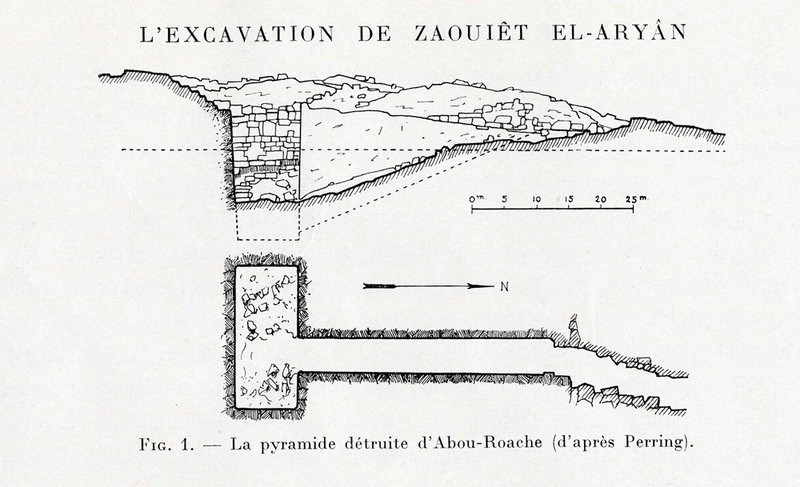 This is Figure 1 from Jean-Philippe Lauer, ‘L’Excavation de Zaouiet el-Aryan’ (‘The Excavation of Zawiyet el-Aryan’). 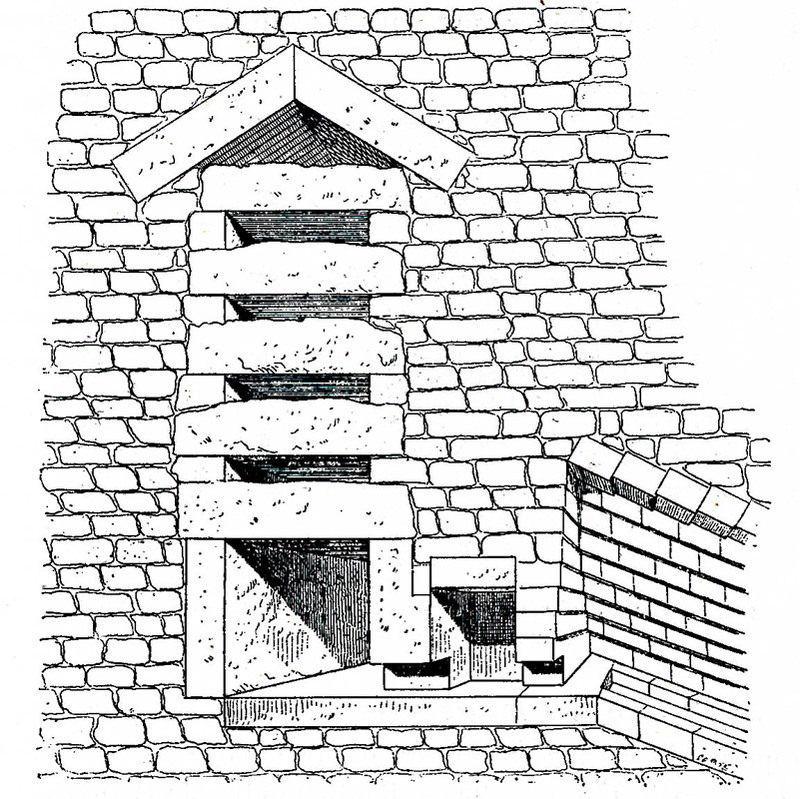 The relieving chambers over the King’s Chamber, seen in a vertical section looking west, as drawn by Charles Piazzi-Smyth and reproduced by him as Plate 14, before page 97, in Volume II of Smyth’s three-volume work, Life and Work at the Great Pyramid, Edinburgh, 1867. Smyth also shows the locations of the graffiti. 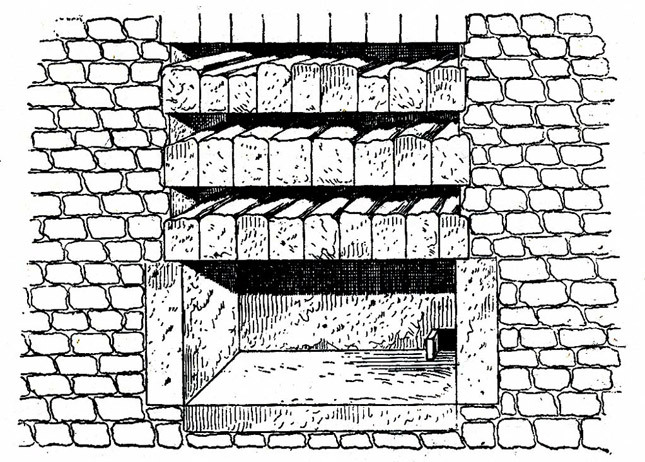 It is useful also to see Smyth’s drawings of the depth of the early 19th century excavations under the coffer (these diggings are now entirely concealed, so that most people are unaware that these ever took place), and the details of Caviglia’s excavations south of Davison’s Chamber. 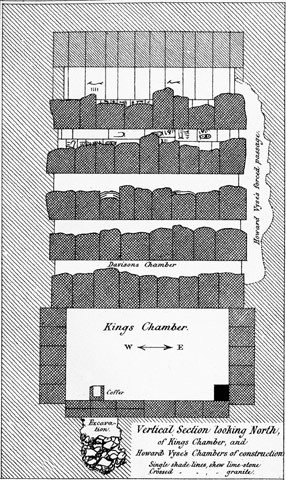 Piazzi-Smyth’s drawing of the relieving chambers above the King’s Chamber seen in a vertical section looking north, being the other half of his Plate 14. 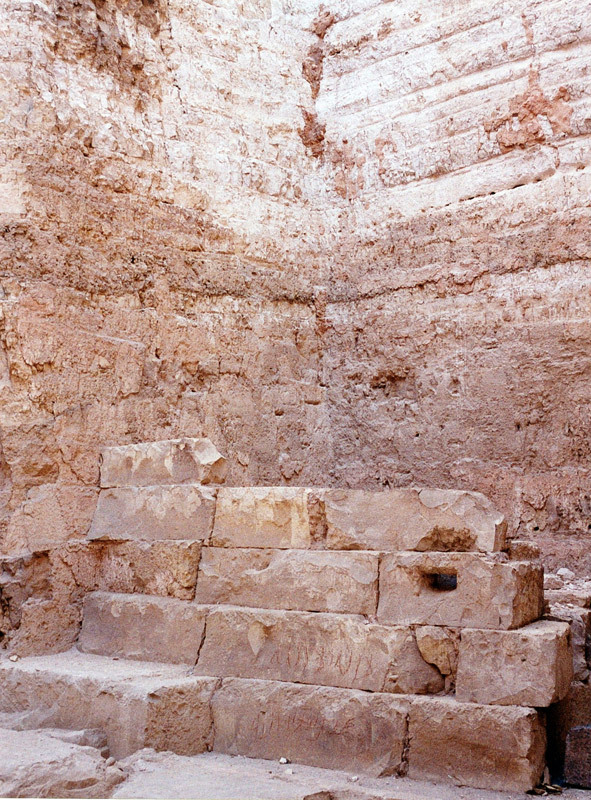 The small black square in the bottom right corner of the King’s Chamber is the entrance. 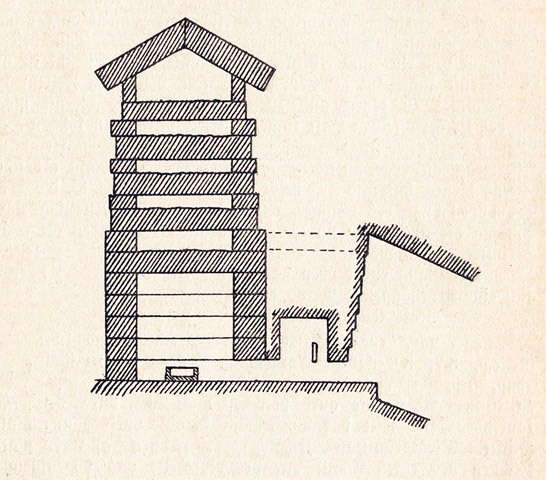 This drawing is from an obscure German pamphlet by Heinrich Hein, entitled Das Geheimnis der Grossen Pyramide (The Secret of the Great Pyramid), Zeitz, Germany, 1921, Figure 2, page 10. (I have prepared a full translation of this interesting pamphlet, and hope to publish it one day.) 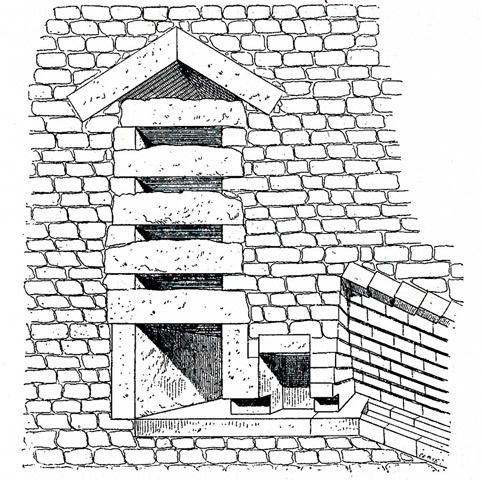 It is particularly useful in that it shows the connecting passage (represented by dotted lines) by which Nathaniel Davison in 1782 discovered what is known as ‘Davison’s Chamber’ inside the Great Pyramid. 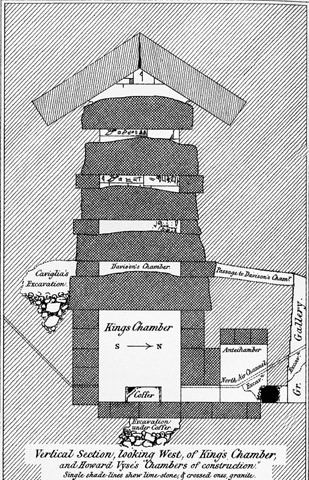 The structure on the left shows the King’s Chamber (with the coffer on the floor also shown) surmounted by a series of ‘relieving chambers’, the lowest of which is Davison’s Chamber. 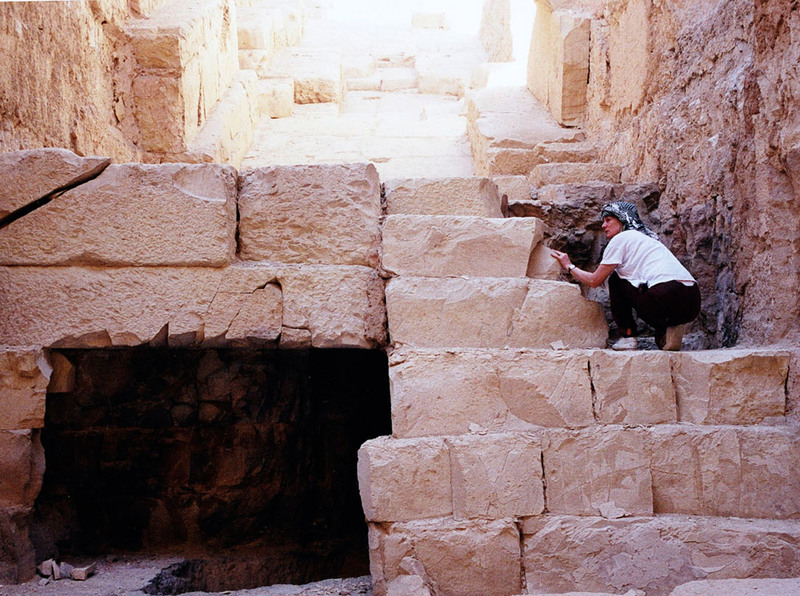 At right, the termination of the Grand Gallery is shown, just below the roof of which is the entrance to the tiny passage shown by the dots. Longitudinal section in perspective view of the King’s Chamber and three of the ‘relieving chambers’ above it. 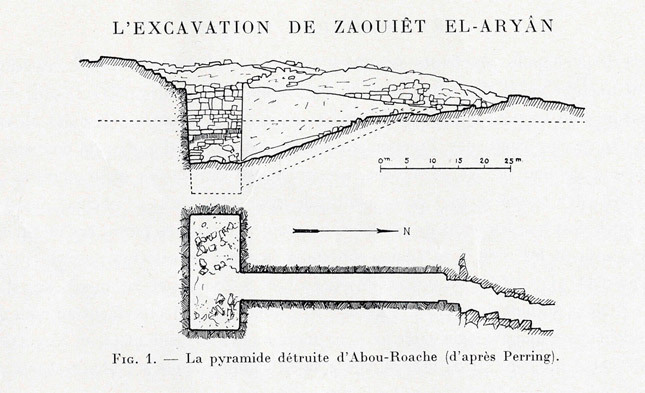 Figure 153 on page 228 in Georges Perrot and Charles Chipiez, Histoire de l’Art dans l’Antiquité (The History of Art in Antiquity), Paris, 1882, Vol. 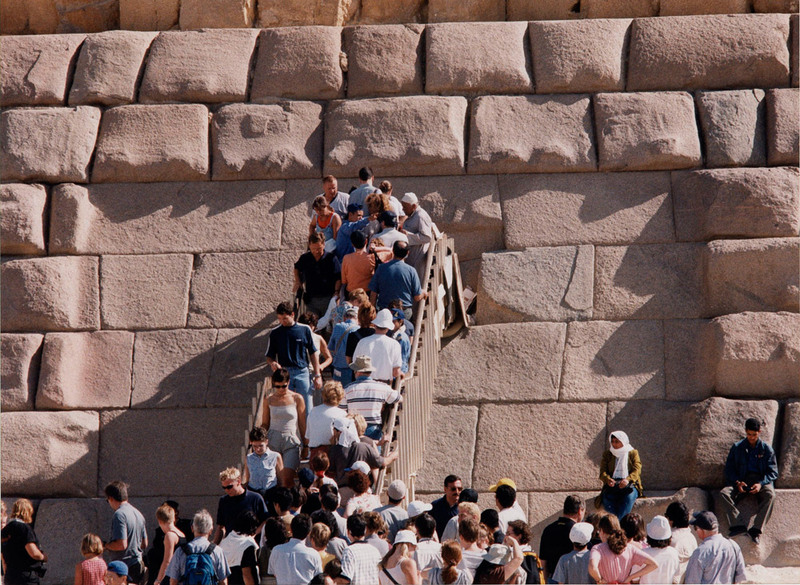 I, l’Égypte. Transverse section in perspective view of the King’s Chamber with the five ‘relieving chambers’ above it, in the Great Pyramid. 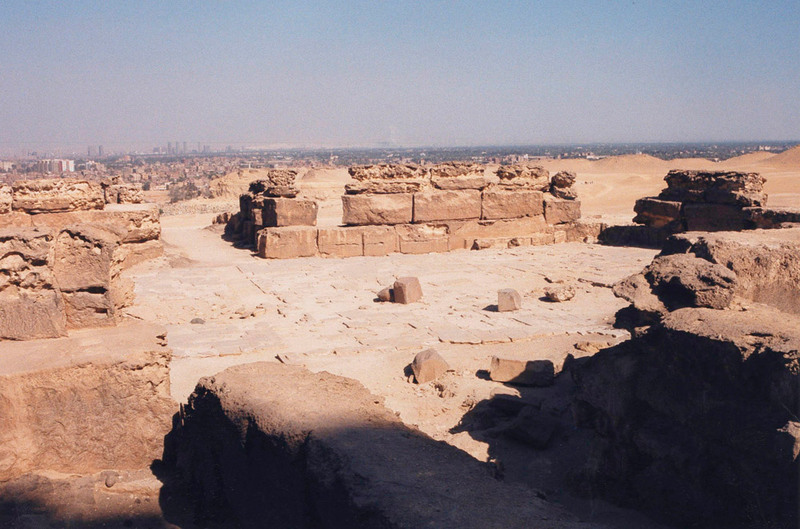 At right is the top end of the Grand Gallery. Figure 152 on page 227 in Georges Perrot and Charles Chipiez, Histoire de l’Art dans l’Antiquité (The History of Art in Antiquity), Paris, 1882, Vol. 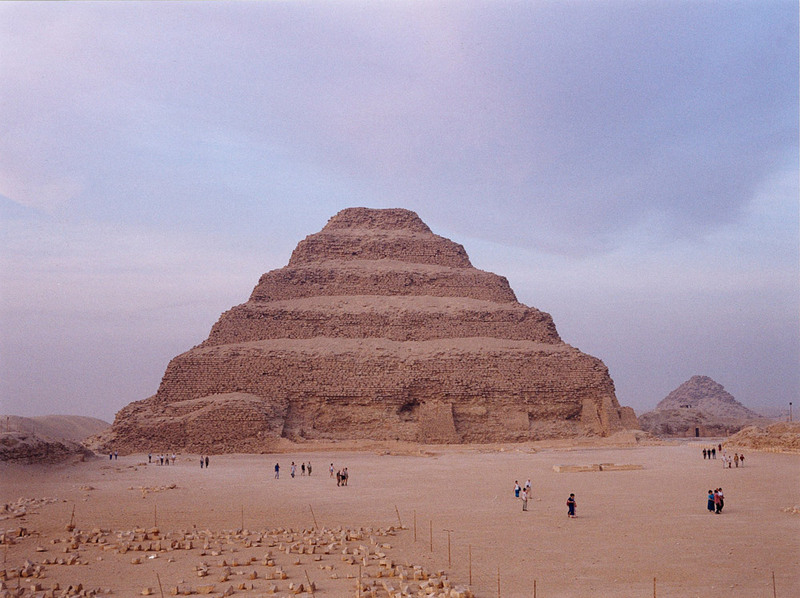 I, l’Égypte. 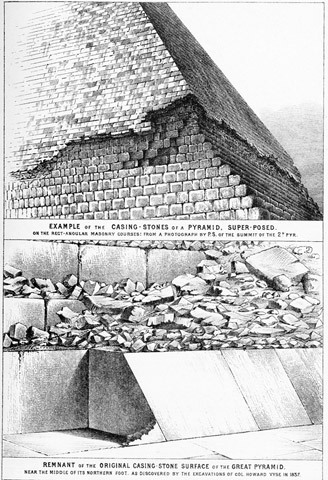 Folding plate opposite page 279, of Volume 1 of Howard Vyse, Operations Carried on at the Pyramids of Gizeh in 1837, 3 vols., London, 1840. Folding plate opposite page 284, of Volume 1 of Howard Vyse, Operations Carried on at the Pyramids of Gizeh in 1837, 3 vols., London, 1840. 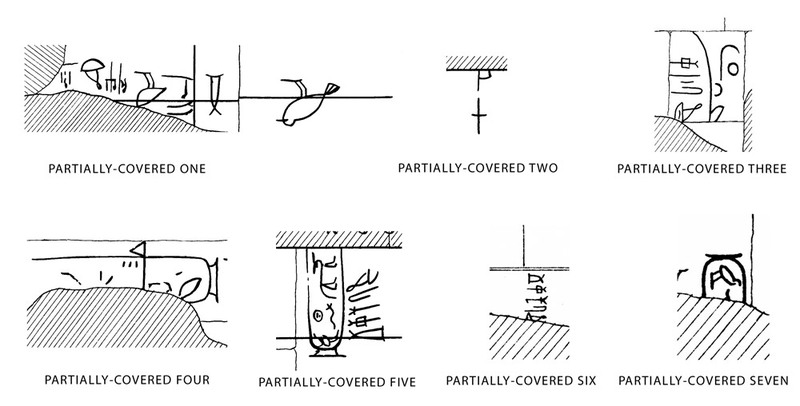 Here are the six whole cartouches which appear as graffiti in the ‘relieving chambers’ above the King’s Chamber inside the Great Pyramid, and which were forged by Howard Vyse and two of his assistants. Not one of the whole cartouches represented in these Great Pyramid graffiti is correct. 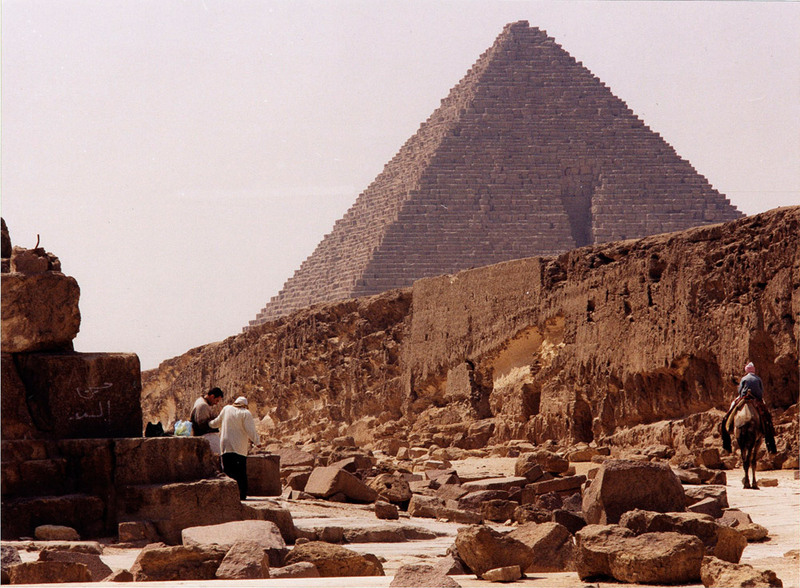 Not one of them gives the name ‘Khufu’ (the Egyptian form of Cheops). 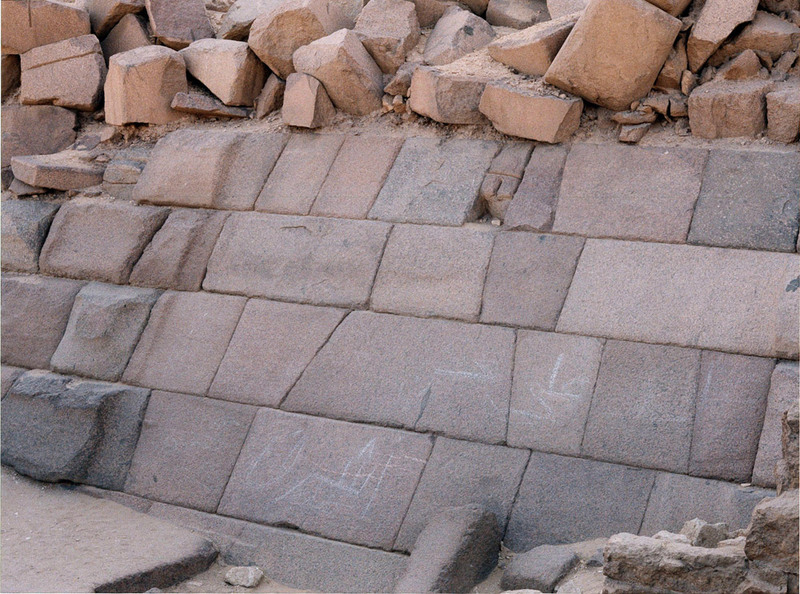 Nowhere in the graffiti does the correct Egyptian hieroglyph for ‘kh’ appear. That hieroglyph is a circle with thin parallel stripes drawn across it diagonally, which is generally thought to represent a round reed sieve. 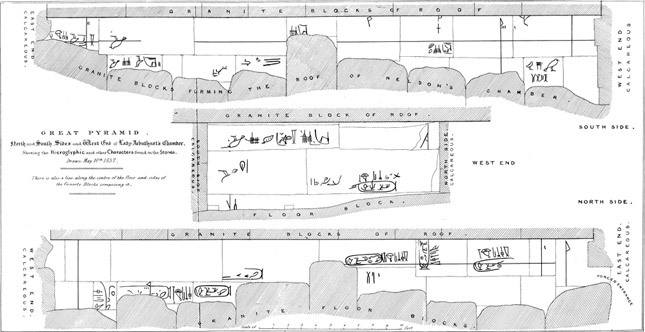 When writing the name ‘Khufu’, one always begins with that and then follows with the signs for ‘u’, ‘f’, and ‘u’. 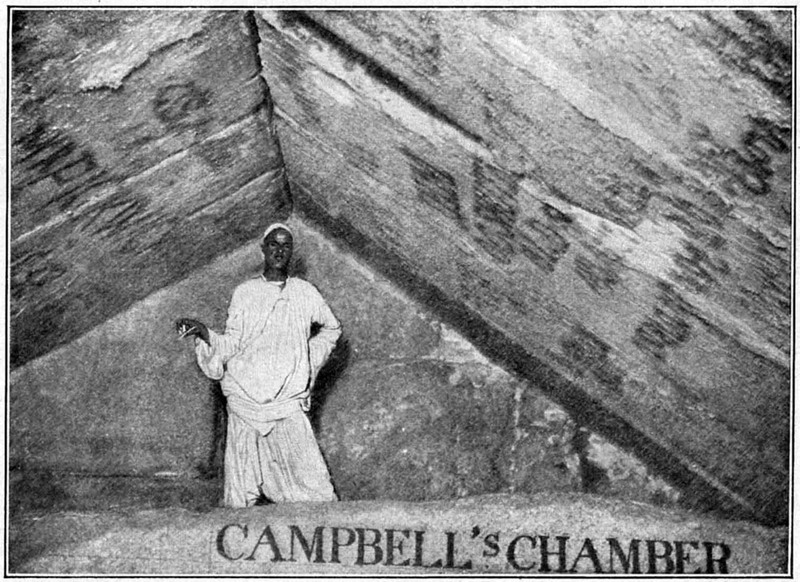 The men who faked these graffiti did not understand correctly at that period in time that this was how the name of ‘Khufu’ was meant to be written. 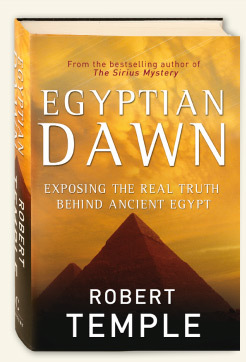 Instead, the circular hieroglyph is shown either with a dot in the centre (which was the sign for the sun, Ra or Re), with a dot and a line in the centre (which means nothing and is a sign which never existed), or with a splodge in the centre which is of indeterminate shape. When the solar hieroglyph is used in these graffiti, the reading is thus: ‘… -raf’, and is definitely not even ‘…khaf’, much less ‘khuf’. 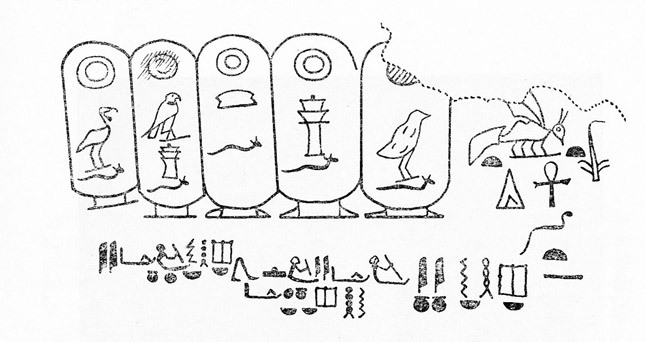 The little chicken used as a hieroglyph for ‘u’ by the Egyptians is so badly drawn that it looks more like an Egyptian vulture (which was a different hieroglyph entirely), or otherwise looks like a six year-old’s attempt to draw a fish. All of the whole cartouches found amongst these graffiti are erroneous and pathetic forgeries. 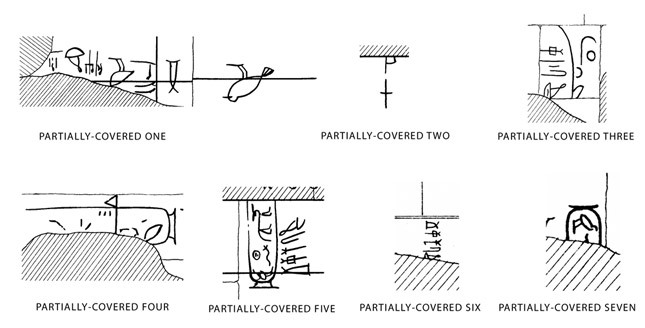 Here are the seven half-covered or partially-covered graffiti found in the ‘relieving chambers’ above the King’s Chamber inside the Great Pyramid. 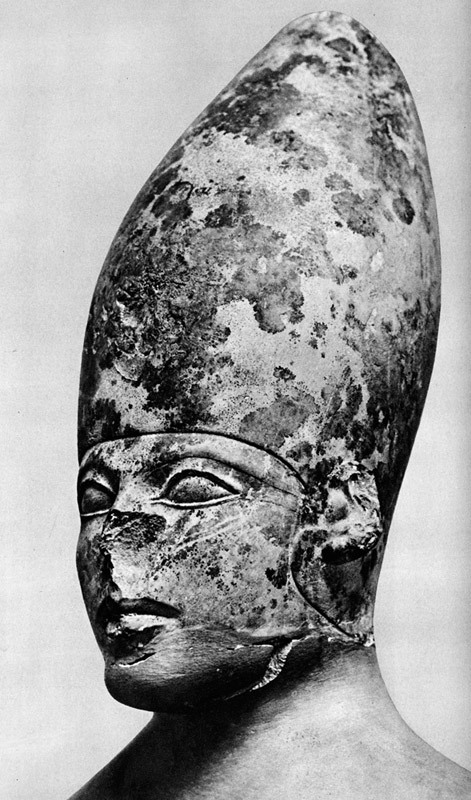 Once again, as with the whole cartouches, the name of ‘Khufu’ does not appear anywhere. There is one pathetic attempt to simulate it, but the hieroglyph which should have read ‘kh’ is again erroneously shown as a disc containing a horizontal line with a dot under it, which never existed as an Egyptian hieroglyph, and the chick at the end is barely even suggested, it is so badly drawn. 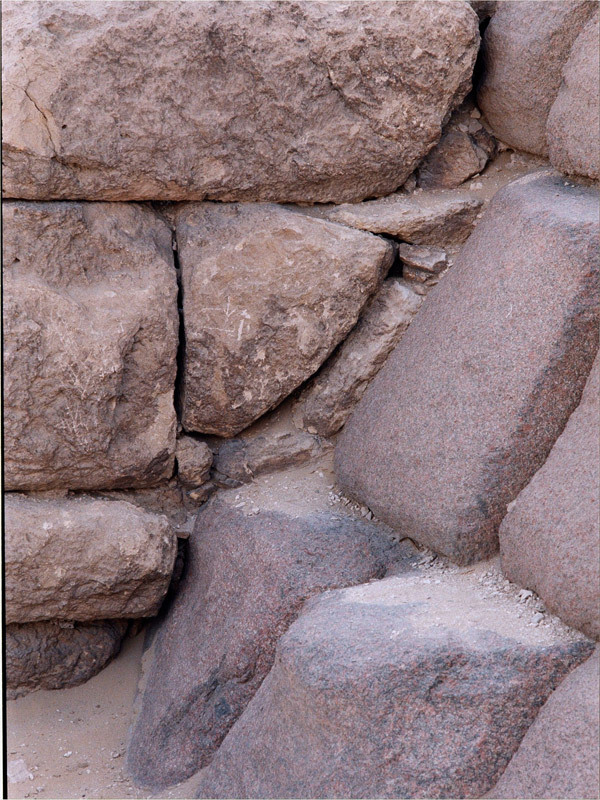 These sketchy markings could easily have been painted up to the edge of an adjoining stone, and there is no evidence that they continue underneath. 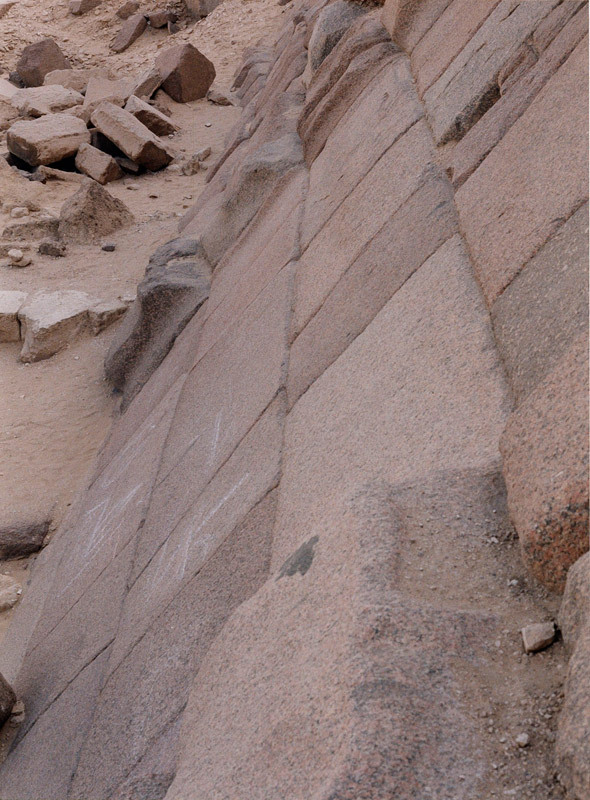 A few of the lines shown here do not even reach the edge, but stop short of it, though without inspecting the original graffiti, it is impossible to know whether this is true of the originals or is a failure of the modern artist in his copying. There is no feature of these graffiti which is in any way convincing, and all of them appear to be fakes made by Howard Vyse and his two assistants.